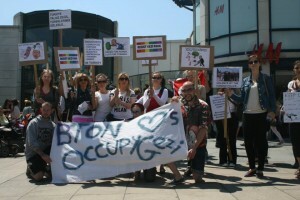 Brighton held two demonstration in order to raise public awareness about the recent incidents in Turkey. Although, most of the people already have some level of knowledge, they have realized how serious the conditions were. Demonstrations have succeeded to attract the attention of the people passing by the streets to the recent developments in Turkey. This entry was posted in Worldwide protests and tagged brighton, worldwide protests on 8 June 2013 .